A green star marks the location of NASA's Curiosity Mars rover after a drive on the mission's 957th Martian day, or sol, (April 16, 2015). The map covers an area about 1.25 miles (2 kilometers) wide. Curiosity landed on Mars in August 2012. The drive on Sol 957 brought the mission's total driving distance past the 10-kilometer mark (6.214 miles). 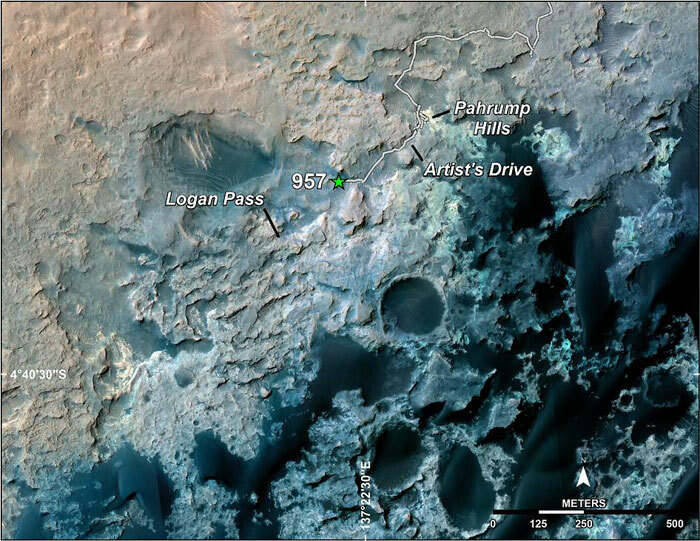 The rover is passing through a series of shallow valleys on a path from the "Pahrump Hills" outcrop, which it investigated for six months, toward its next science destination, called "Logan Pass." The rover's traverse line enters this map at the location Curiosity reached in mid-July 2014. The base map uses imagery from the High Resolution Imaging Science Experiment (HiRISE) camera on NASA's Mars Reconnaissance Orbiter. NASA's Curiosity Mars rover is continuing science observations while on the move this month. On April 16, the mission passed 10 kilometers (6.214 miles) of total driving since its 2012 landing, including about a fifth of a mile (310 meters) so far this month. The rover is trekking through a series of shallow valleys between the "Pahrump Hills" outcrop, which it investigated for six months, and the next science destination, "Logan Pass," which is still about 200 yards, or meters, ahead toward the southwest. "We've not only been making tracks, but also making important observations to characterize rocks we're passing, and some farther to the south at selected viewpoints," said John Grant of the National Air and Space Museum, Washington. Grant is a Curiosity science team member who has been the team's long-term planner in recent days. A drive of 208 feet (63.5 meters) during the mission's 957th Martian day, early Thursday, took Curiosity past a cumulative 10 kilometers of total Martian ground-distance covered. This is based on mapped distance covered by each drive; by wheel odometery, the rover reached 10 kilometers last week, but the mapped tally is considered a more precise measure of distance covered, excluding wheel slippage. Curiosity is examining the lower slopes of a layered mountain, Mount Sharp, to investigate how the region's ancient environment evolved from lakes and rivers to much drier conditions. Sites at Pahrump Hills exposed the mountain's basal geological layer, named the Murray formation. Nearby, high-standing buttes are examples of terrain called the Washboard unit, from its corrugated appearance as seen from orbit. "The trough we’re driving through is bounded by exposures of the Washboard unit, with gaps at some places that allow us to see farther south to higher exposures of it," Grant said. "At Logan Pass, we hope to investigate the relationship between the Murray formation and the Washboard unit, to help us understand the ancient depositional setting and how environmental conditions were changing. The observations we're making now help establish the context for what we'll see there." "The rover's mobility has been crucial, because that's what allows us to get to the best sites to investigate," Grant said. "The ability to get to different sections of the rock record builds more confidence in your interpretation of each section." From observations made by NASA's Mars Reconnaissance Orbiter, topographically ridged terrain that has beenategorized as the Washboard unit has been mapped at many locations around Mount Sharp -- on the south flank of the mountain as well as the northern flank Curiosity is climbing -- and on the surrounding plains. "Understanding the Washboard unit and what processes formed it could put what we've been studying into a wider context," Grant said. Curiosity spent much of its first 12 months on Mars investigating locations close to its landing site north of Mount Sharp. Findings during that period included evidence for ancient rivers and a lakebed environment that offered conditions favorable for microbial life, if Mars has ever hosted life. After leaving the landing vicinity, Curiosity drove to reach Mount Sharp, with a few extended stops at science waypoints along the route before arriving in September 2014.